The Nike+ version of the latest Apple Watch launched a couple weeks behind the other models, but we now have ours to check it out and what makes it different than the standard aluminum. Unlike the other models, where the aluminum and stainless steel come in white packaging and boxes, the Nike+ edition comes wrapped in black paper with black boxes. Bundled with the watch is the usual 5W wall adapter and all-plastic magnetic charging puck -- same as the standard aluminum version. There are a few distinct differences between the Nike+ version and the others. 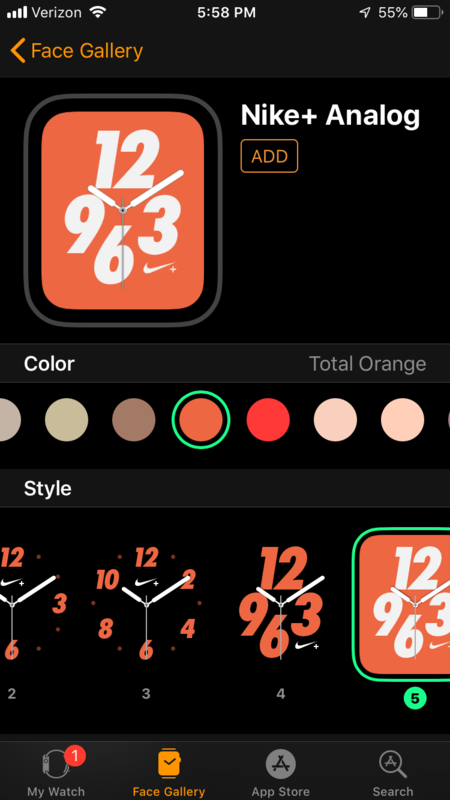 First, are two exclusive watch faces that have been updated with new colors to support Apple's latest Sports Band and Sport Loop colors. There is an analog and digital option, both of which have a non-removable Nike+ logo to jump directly into the Nike+ Run Club app. On the rear ceramic back is an etching that designates it a special Nike+ edition of the Series 4. Plus, there are exclusive band options including a new reflective band, and styles that can come bundled. Otherwise, the Nike+ version is the same as the others, including the cost. There are both 40mm and 44mm sizes, and GPS+Wi-Fi or cellular configurations. If you haven't already, check out our review of the Apple Watch Series 4 to see what to expect with the Nike+ version. Nike is currently accepting orders for the Nike+ Series 4 devices, with free delivery in an estimated two to four business days or next day delivery available for an additional $25. Apple authorized resellers B&H Photo and Abt.com are also accepting orders for the Apple Watch Series 4 Nike+, with Abt.com currently reporting a two to four week delay. The perk is the lack of sales tax collected in most states, with B&H collecting sales tax in New York and New Jersey and Abt.com collecting sales tax in Illinois, Indiana, Michigan and Wisconsin (see here for details). I was very disappointed that you didn't show the Nike watch face with smaller numbers, and with complications. So far, I haven't seen anyone do this. Stand by. We'll be talking more about the Nike version very soon. It looks like the Nike+ is still only available in Space Gray and Silver. The round corners on this watch really throw the symmetry off with notification graphics like this. Fortunately they aren't meant to last long, but it really makes this look like the Moto 360 with the flat tire and all. Not as bad of course, but generally. I don't know of anybody who would buy a Nike version of the AppleWatch just for the watch face. It is designed to meet the needs of athletes and athletics -- but you wouldn't know it from this review. Apple's main thrust for the AppleWatch is for health, fitness and athletics. And that is particularly true for the Nike version. AI needs to get a few athletes reviewing the AppleWatch. Take it out for a run and see what happens. Compare it to a Garmin and/or FitBit. The geek reviews and fashion reviews are good and they're helpful. But they're like reviewing a Masserati to get to the supermarket. They miss the main point. I’m more than happy with my stainless steel AW4. I removed the white band it came with and replaced it with the black stainless steel band I bought for my now sold AW3. I don't know of anybody who would buy a Nike version of the AppleWatch just for the watch face. That's of no important. Nonetheless, you do now, sort of. I plan to buy a Nike+ because of the Watch faces. As they are free, and I plan to own Space Gray and Silver Watches, there's no reason for me not too. I could be Apple (non-Nike+) Watches and download the Nike app, for the same money. The only difference would/might be the bands, depending on my choice, and the lack of the Nike Watch faces. I like that they take advantage of the larger display and its shape. I do like gold Watches when the gold is done well and the shade to my liking. I've never cared for most inexpensive gold watches because they're obviously plated ("gold fill") and they look tacky. I really like the Gold Stainless, but won't be getting one. One of my Watches is a Gold S2. To that end, I wish AI had compared an S2 and S4 Aluminum Gold Watch. Opening apps are quick. Every other watch would lag. The screen is a big improvement. Previously I had to take my eyes off what I was doing to focus on the watch screen. It is now big enough to catch things at a glance (like say, when driving or biking). The watch sits better on the wrist - lower, sleeker. Looks less square, bloated and dorky. Apple app integrations like Podcast, Apple Music playlist and Homekit are pure Apple gold. being able to run 3rd party apps and the quality, also feels best in class. Using a weight lifting program in the Garmin for instance, isn't good. The Strong app on the AW is great. The AW4 finally has all the features present (altimeter, baro, GPS, waterproof, etc) to make this the first generation where nothing is being left out and you can't go wrong to buy in. Battery life is the same as S2 but charging takes 2x. 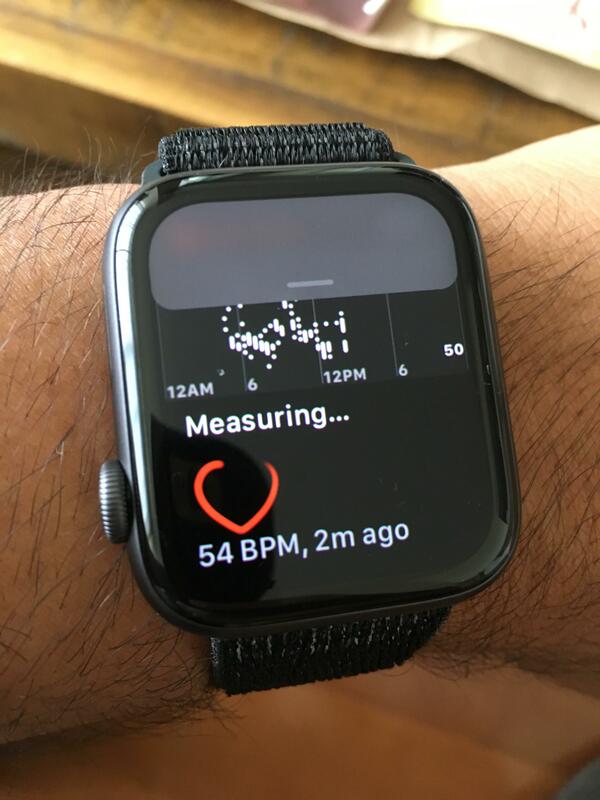 I used to wear the S2 watch all day and night for sleep tracking, top off for 20-30min in the morning during breakfast and leave the house with 100%. The S4 seems to be taking at least an hour to top off from the same place and is messing up my flow. Cost went up. $500+ now for an aluminum LTE enabled watch is OK but not on the annual upgrade cycle Apple is pushing. 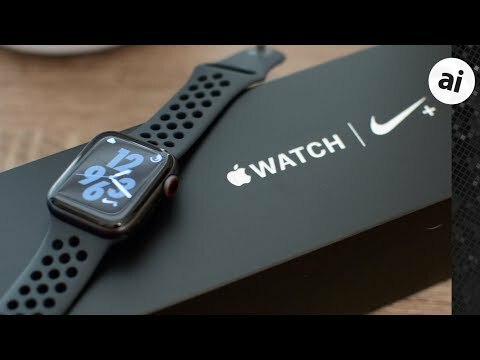 It's still cheaper than a Garmin but the price changes recently across all of Apple's product line isn't sitting well and this adds salt to things. No always on display. This is a big, big thing I like on the Garmin and didn't realize it until wearing an AW again. Battery life (again) - the Garmin will last 2 weeks in smartwatch mode. I don't expect that (yet) from the AW but being able to go a full weekend without having to make compromises (theater mode, etc) would be nice. GPS and performance tracking - DC Rainmaker really gets into these kind of comparisons but I did a side by side bike ride wearing the AW4 and FR935. When you look at the GPS track overlay on a map for the AW4, it was awful. It frequently had me on the wrong side of the road, smoothing out corners, etc. The overall distance recorded was very close with both watches but this raises questions. Active calories burned varied by 220 calories between the Garmin and AW. Strava estimate mirrored the Garmin. Calibration options - I wore both for one day. The difference in steps for the day varied by 1500 steps (same wrist). The 'stairs climbed' metrics for the AW and FR935 on the same day, 4 vs 12. I think the Garmin over counts but I also know I went up the steps more than 4x yesterday. I am aware the limitations of baro pressure and floor calculations in mobile devices and it should only be an estimate but, Garmin at least gives you the option to calibrate some of these settings for a baseline. Thanks! That was helpful and informative. I would disagree about your assessment of the health app. While I don't know of anything else out there like it with everything collected into one spot, it also feels like a black hole to me. A ton of data goes in, but you only get tiny little meaningless graphs with no "y axis" scale. Apple can and should do better. @GeorgeBMac I hear you. I guess I was thinking how they have all your body measurements, nutrition *and* movement captured in one app. But you're right, it seems to be a one-way street. You can export your Health data in raw form but not much else. One thing I really like with AW are those 3 rings. It makes it really easy to glance and know where you are. I have figured out how to track something similar in Garmin Connect but its in 3 different places. I wish Garmin would copy that. The iTunes and HomeKit integrations are really, really convenient as well. I am down to an internal debate of keeping Garmin FR935 only or go with a combo set up like the AW4 & a Garmin 520+ bike computer. I think am leaning FR935 for now. It does a lot for a single device. The GPS tracking seems more accurate. The metrics are more easily shared with other applications. The battery life and always on screen are a big benefit. I also like that the Garmin has less notifications going on. My wrist is quieter which I appreciate. I know I can turn them off but the Garmin feels like a watch where the AW feels like a small iPhone on your wrist. Still, the AW4 is a very, very nice device. After all the Series iterations, this is the one to get. I would even upgrade from a S3 for it. I think most serious athletes opt for Garmins. I guess I qualify as serious athlete (just a not very good one though!) -- but I still opt for the AppleWatch because of all the other things it can do. Which, of course, plays right into your comment that it feels less like a watch and more like a "small phone on your wrist". But now I have another reason to go with the AW: As an old person living by myself, having the ability to call for help at any time is a big safety feature. I suppose the fall detection thing is a plus, but I worry more about the general accidents -- say while cutting the grass -- than anything else. I wonder if your Garmin could be setup to feed the Apple Health App? There are a number of devices and apps that can do that, not just the AppleWatch. 3km as mapped in Google. AW logged 3.06, Garmin shows 2.89km. GPS rendering on post-run map still smoothes out corners on the AW where the Garmin plots better follow the road. AW shows 276 cal burned. Garmin 256. A quick online calc says it should be 253 cal. Other stuff like avg pace and VO2 estimates were different. I won't embarrass myself by posting those but the reported pace varied by 30 seconds with Garmin reporting the slower time (interestingly steps per minute were the same). Plenty of articles to cast doubt on wrist based VO2 estimates but what the devices report differs by 2mL in Garmin's favor. Some metrics fall in AW's favor and some for the Garmin (such as, I find it interesting Garmin reports a slower run pace but better VO2 max estimate). All in all, probably not enough distance to really gauge things. I am more of a biker and do more comparisons there. I think the AW4 is a great all around device and the casual user can't go wrong. Especially when coupled with some of the other smart watch features not present on a Garmin. It's good that we have the choice between two great devices! The Nike edition...does it send for help when you kneel for the National Anthem?